In the shadows of Norma Desmond-era Hollywood, just 49 steps south of James Caan's star on the Walk of Fame, is a vestige of Tinseltown's long-vanished Golden Era bar scene. Passing through the black curtain, you adjust your eyes to the dimly lit, art deco interior, and enter the legendary, defiant outpost of fun known for seven decades as Boardners, home to some of Hollywood's best late night noshes, stiffest drinks and booziest lore. The history of the building (located at 1652 North Cherokee Blvd to be exact) mirrors the history of Hollywood itself. 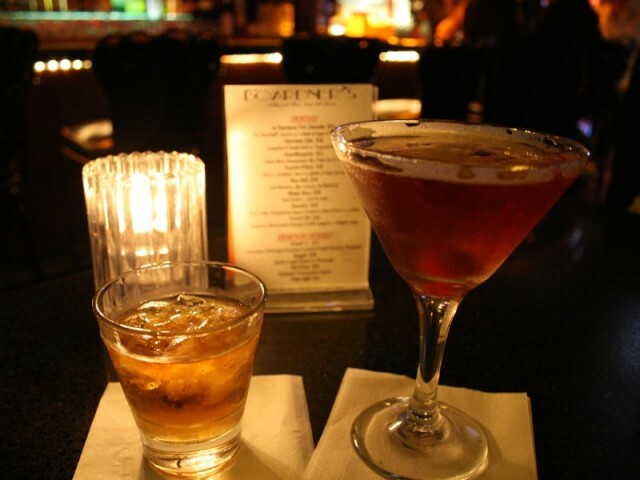 Boardeners has been serving the public since 1927 (the year of the inaugural Oscars) when crooner Gene Austin named the bar My Blue Heaven, after his chart topping song. Like any respectable 1920s cocktail lounge, My Blue Heaven was complete with a smiling hat check girl stationed in the location of the present-day bar. It then became The Cherokee Men's House, one of the first nightclubs catering to homosexual clientele. 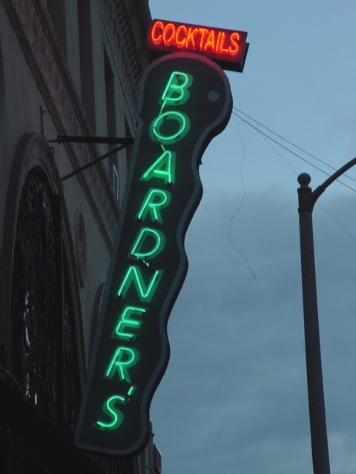 In the 1930s, the bar disguised itself as Morressy's Hair Salon (a front for a Prohibition-era illegal card club and gambling speakeasy) before an Akron-born golf-caddy named Steve Boardner took a freight train to Los Angeles, and in 1942, bought the place, affixing a neon sign that bore his name that still hangs outside. 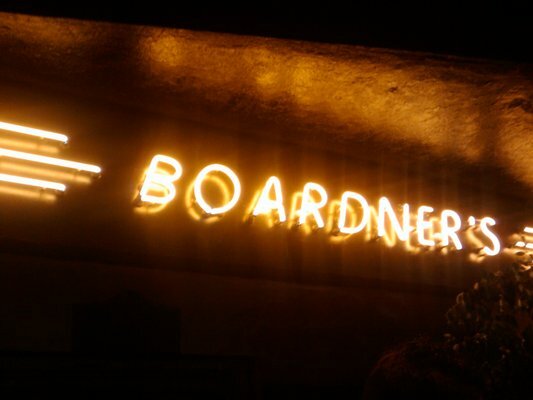 Seventy years later, Boardners still serves Moscow Mules, Mint Juleps, and Pimms' Cups to a clientele of neighborhood residents, and the occasional star, every night til 2 a.m. Through the 1940s, Boardners was the meeting place of secret men's societies including The Hot Stove League, Masquers and Saints & Sinners. It was also one of the city's most notorious horse gambling and roll-of-the-dice hot spots for Hollywood's elite. Appropriately, the film L.A. Confidential was shot here, as was Ed Wood -- also fitting, considering the title character frequented the bar for his favorite poison (scotch and water). 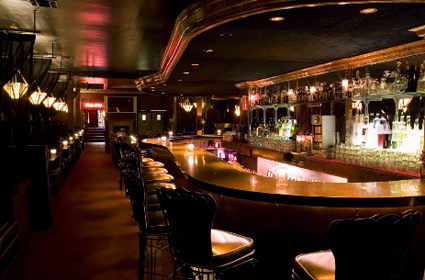 Others who enjoyed Boardners' 75 cent drink glory days include Errol Flynn, jazz singer Peggy Lee (tall scotch and water with lemon twists), Mickey Mantle (bourbon and ginger ale), and actress Elizabeth Short, who had her final beer at this watering hole before stepping into the night and becoming The Black Dahlia. Entertainer (remembered by Disney fans as the voice of Baloo the Bear in The Jungle Book) would say good night to his costar, and wife, Alice Faye, at Musso & Frank's (Hollywood's oldest existing eatery) before heading across the Boulevard to meet his mistress at Boardner's for coffee and anisette. More recently, actors such as Russell Crowe, Vince Vaughan, Kiefer Sutherland, Heath Ledger, and rockers including Courtney Love, Terri Nunn, Axl Rose, Tommy Lee and Slash have patronized the tucked away hot spot. Sally, our favorite waitress, says, "This is a laid back place. People can just be themselves. We get celebrity faces in here who want to come in for a drink without getting harassed." As it turns out, Sally's also a DJ at Boardners' next door dance club (both owned these days by Tricia La Belle). The club and the bar share a secret Spanish-style courtyard in the back where bands play live music on Tuesday nights (buy one, get one free night!). In the center of the courtyard stands a Moroccan-tiled fountain where actor William Powell once posed with showgirls for a famous clothing store advertisement. Sally informs us she spins on Saturday nights at Bar Sinister (Mecca for L.A.'s red vampire wine-sipping goths) complete with original tombs from Paris' Pere La Chaise cemetery. While some of Boardners' ghosts are apparitions of the past, others are reportedly in the here and now including the spirit that haunts the small women's restroom. These days, the bar is renowned as much for its colorful history as its decadent dining options. Chef Bloody Bill (a.k.a. William Annesley) has refurbished its menu with some very big flavors, including mouthwatering BBQ ribs with Bloody Bill's tangy sauce, pan seared bacon-wrapped scallops with pomegranate molasses, and for eight dollars, a generous portion of nachos that I'm told is Boardners' most popular dish. Bloody Bill says, "This is, was, and always will be, a bar. And now, it's a bar with good food. Each dish is fifteen dollars or less, and everything is made from scratch. With a menu that takes you around the world, there is definitely something for everyone. And it's cheap and cheerful. We do count on the fact that you're going to be drinking liquor." My comrades and I enjoyed perfect Grey Goose martinis (with just the right amount of vermouth) in a darkened booth, where decades earlier, long-forgotten movie stars got drunk, placed bets, had torrid affairs and helped build Boardners into one of Hollywood's great unsung monuments to endurance.